Today, it's a pleasure to share a classic but yet easy-to-make oven roasted whole chicken recipe. The ingredients mix is just a classic combo for the chicken, and it is pretty easy to get fixed as you can see from the steps outlined below. The juicy and enticing spiciness of the flavours mixed with black peppercorns and parsley leaves are quite a perfect match. 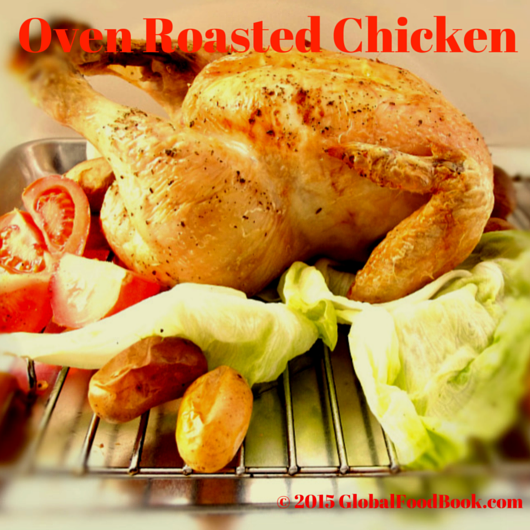 I love roasted chicken either whole or parts but for this recipe, instead of cutting the chicken into pieces, I decided to roast it whole. The roasting, kind of took some time because I used a low heat so that the chicken cooks slowly and properly without getting burnt as you can see from the look of the chicken... So tempting to eat and super delicious!!! I drizzled some lemon juice over the chicken as well as parsley, salt, black peppercorn and olive oil over the chicken and the ingredients melted into the chicken while distributing some delectable aromas all over the house. 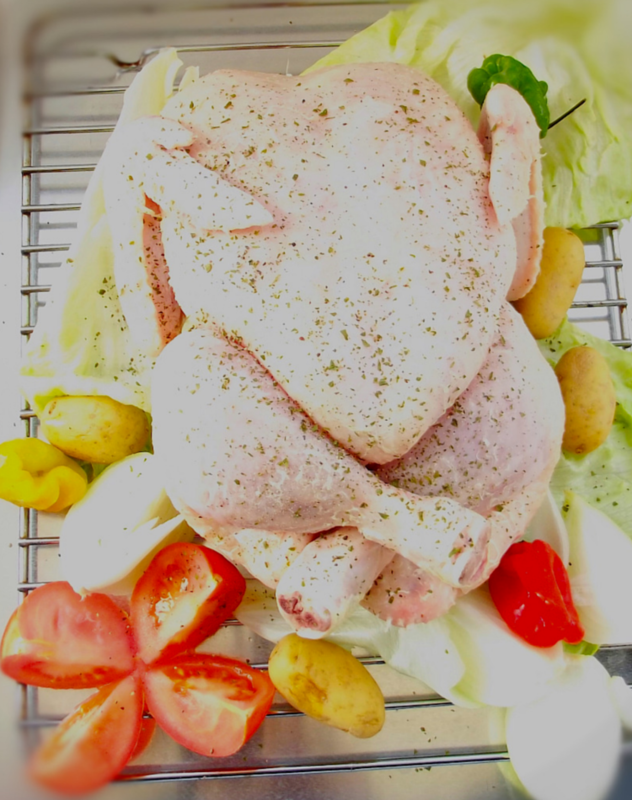 Add a little bit of color to the chicken with some lettuce, fresh tomatoes, onions and roasted potatoes and you have for yourself a colorful side dish to be proud of. 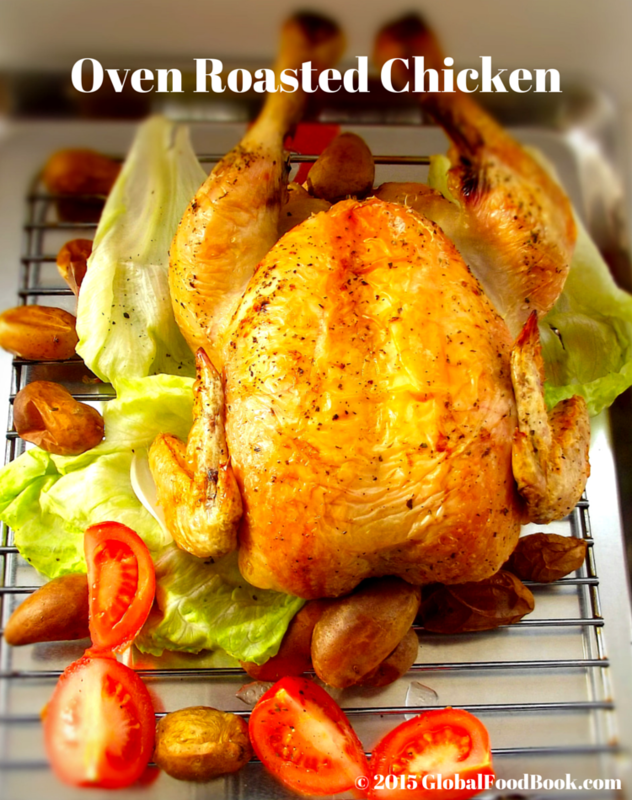 I love goldenllllllyyyyyyy roasted chicken, they are just the perfect simple side dish you can think of.... either eaten alone or alongside with other main dishes. While there are loads of other really awesome garnisherrrsss available out there, these ones I have just listed are still okay for me in the absence of others. The parsley herbs penetrated through the chicken thereby giving the chicken some aromatic herbal flavor punch, although I will have a mix of other flavors in the future for a change of taste. 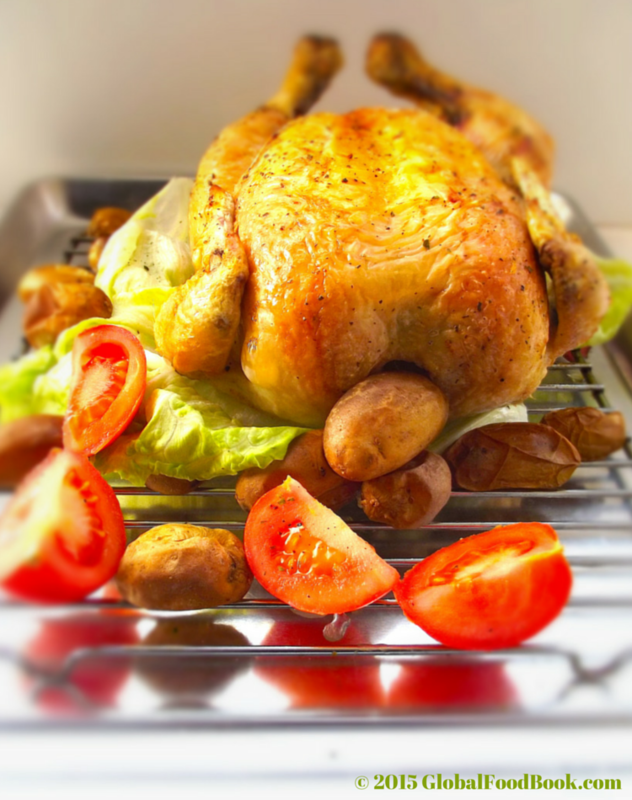 A perfect oven roasted chicken recipe will leave your chicken juicy, soft, golden brown in color and aromatic. So aromatic and capable of causing your tongue to drift out of your mouth in readiness to devour the chicken. Do you want to know the outcome? The chicken came out beautifully and colorfully on point! I have roasted chicken in the past, but this particular one turned out far better than the ones in the past and I hope the future will be better than today's version. It really helps to slow roast the chicken to get the internals perfectly cooked and done. The secret to this colorfully browned roasted chicken is the medium temperature used, which prevented the chicken from getting burnt and at the same time cooking nice and slowly with all the ingredients sealed in, to create a tender and juicy chicken with adorable golden crispy skin. The recipe is so easy that you can tweak the ingredients and substitute mine for whatever you like but most importantly, ensure you used an appropriate heat temperature to prevent the chicken from getting burnt thereby giving an awful outcome. Always endeavour to pierce the chicken with a skewer to ensure that the chicken is properly roasted before consuming. Wash and rinse the chicken thoroughly before drying it with a kitchen roll. Place the chicken in a clean bowl, drizzle 1 tsp. of olive oil and lemon juice over it. Add salt, pepper and parsley leaves and then use clean hands to rub in the ingredients properly in and out of the chicken. Stuff the chicken cavity with some of the potatoes and then drizzle the remaining olive oil over the chicken. Place the chicken in a baking dish and allow to marinate for at least 1 hr. Meanwhile, pre-heat the oven to 150-200oC. 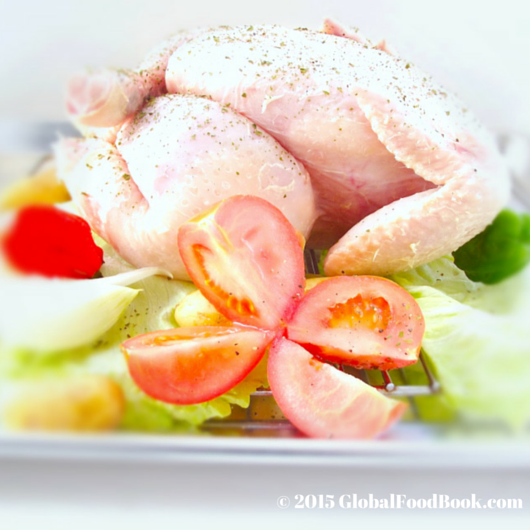 Place the chicken in the oven and roast until the chicken is properly cooked internally and externally. Use a skewer or fork to pierce the chicken to ensure that it is properly cooked inside. Also check that the chicken is golden brown in color before removing from the oven. Serve garnished with lettuce, roasted potatoes, fresh tomatoes and onions or as desired.